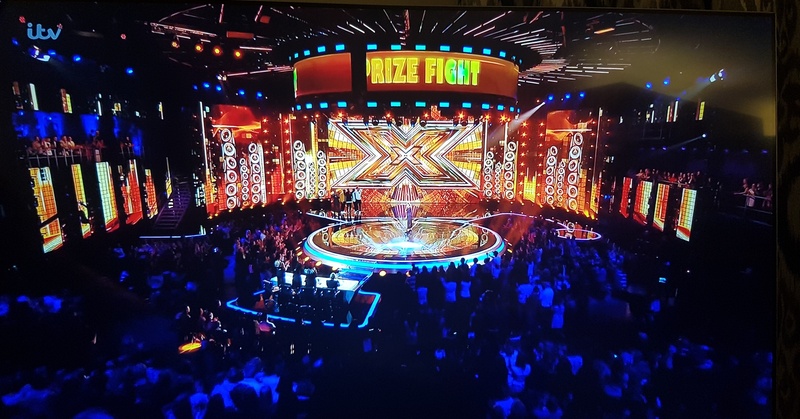 Anna Valley has again been chosen by production company Thames to deliver LED display technology for the ITV studio Live finals series of the X Factor. All the screens on the Saturday & Sunday night shows being fed by Hippotizer media servers also supplied by Anna Valley. Anna Valley have incorporated high-resolution 3mm LED displays into the set. The central Giant size 4K LED doors were used as devices for judges to introduce the competing new artists who they were mentoring. The LED doors can feature ‘glamour’ shots of the acts, close-up camera shots of performances or lighting effects patterns. All the displays were selected for their ability to match colourimetry and have minimal, compatible video processing delay. The X Factor Live Finals returned from a new home at LH2 studios in a new set being larger than ever and even more spectacular. Anna Valley Supplied over 22.9 million actual LED’s and Running 10 x 4k processor. AV3 LED panels make up the main screens and scenic columns, OD4 LED panels make up the header above centre stage, with AV7 LED floor directly beneath the header and hundreds of meters LED Flex in various lightboxes, supplemented by MiSTRIP in the ceiling. Various extras were added each week for contestant performances and guest artists. Rita Ora used an 8×10 super high res screen in AV2 built leaning forwards towards Rita. Matt Terry used several 31k Panasonic projectors with mapping and for Tokio Myers Anna Valley supplied five Panasonic 21k projectors onto a cube made from gauze. All performances visualisation came from Green Hippo Media Servers that Anna valley supplied. The live shows required Anna Valley to set-up these extras during the brief time of commercial breaks, so no pressure there!